I. Robert M. Wright (see frontispiece) was born at Bladensburg, Prince George County, Maryland, September 2, 1840. His father was born at Alexandria, Virginia, in 1800, and when a mere boy was on the battle-field of Bladensburg, administering to the wounded soldiers. His great-grandfather was a Presbyterian minister, and during the Revolutionary war raised a regiment of militant plowboys, at Elizabethtown, New Jersey, of which he had command at the battle of the Meadows. The British set a price on his head and destroyed all his property. His wife was shot by a Hessian soldier, as she sat at her window with a babe in her arms. Her husband was killed by Tories. His grandfather on his mother's side was Elias Boudinot Coldwell, for many years clerk of the United States supreme court, whose residence, and private library, which had been loaned to Congress, were destroyed by the British in the war of 1812. When sixteen years old, Robert M. Wright took a notion to come West. He settled in Missouri and worked on a farm near St. Louis until 1859. He made an overland trip with oxen in that year, reaching the town of Denver in May. He crossed the plains four times by wagon and twice by coach. He worked for three years for Sanderson & Company, and then became a contractor for cutting hay, wood, and hauling grain. He was appointed post-trader at Fort Dodge in 1867. He has been farmer, stockman, contractor, postmaster, and merchant. He has four times represented Ford county in the legislature. In 1899 he was appointed commissioner of forestry, and was reappointed in 1901. He resides in Dodge City. reference to R. M. Wright. Going into western Kansas in a very early day, this gentleman was, in 1866, appointed post trader at Fort Dodge. During a long and prosperous career, he has been successively a stockman, freighter, contractor, merchant, politician, farmer, county treasurer, state forest commissioner, postmaster, and representative of Ford county four times in the legislature, and once mayor of Dodge City. No man has been more closely identified with the remarkable history of Ford county than Mr. Wright. He is now living in feeble retirement in the old town which he helped make famous, while his experiences would fill an interesting volume. The following is given as a characteristic anecdote of his early life. It happened while Bob was serving as mayor of Dodge. "'A feller in that 'ere Green Front has just robbed me of more'n sixteen dollars, an' I wants ter have 'im pulled.' " 'Been gambling, have you?' retorted the Honorable Bob. Then addressing the city marshal, Bill Tilghman, who was just crossing the street, he yelled: 'Here, Bill, is a fellow that has been gambling. Run him in.' So they hauled the prisoner to the police court, where he was fined ten dollars and costs, as an object lessen to those who might presume to violate the anti-gambling ordinance of Dodge City." president; Colonel Richard I. Dodge, commanding Fort Dodge; Major E. B. Kirk, post quartermaster; Major W. S. Tremaine, post surgeon; and Captain T. C. Tupper. The county of Ford was organized in 1873. Dodge City, according to the census of 1901, had 2,199 population, and the county of Ford, 5,302, since when, however, said population has probably doubled. The town is four miles west of the site of the fort. 3. Jim and Bill Anderson (see Chapter I, page II) killed Judge Baker and his father-in-law, George Segur, at Baker's home on Rock Creek, a few miles east of Council Grove, on the night of July 3rd, 1862. 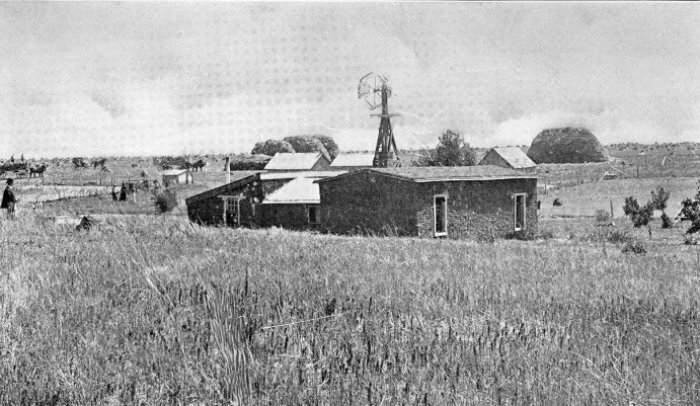 Baker kept a supply store near the Santa Fe trail. The Andersons were hard characters from Missouri. At the commencement of the war they took to the brush. On one of their marauding expeditions in the spring of the year, they stole two horses from Mr. Segur. 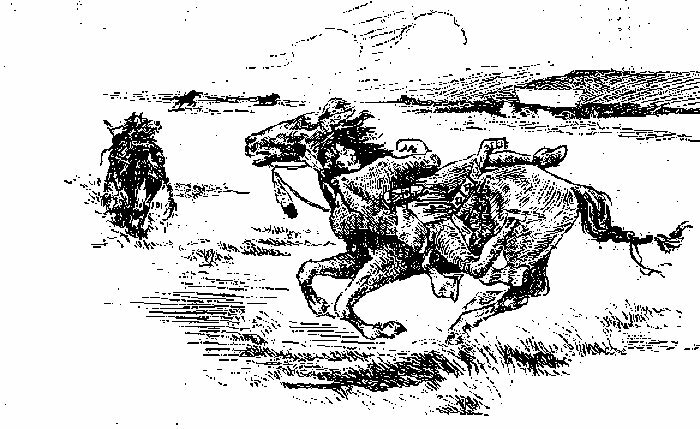 Baker and friends gave chase, and, overtaking the party west of Council Grove, recovered the horses. Baker swore out a warrant for the arrest of the Andersons. Old man Anderson, hearing of this, swore he would take Baker's life, and, arming himself with a rifle, started for Baker's home. Baker had been informed, met him prepared, and, getting the first shot, killed Anderson. July 2nd, the Andersons skulked around Baker's home, but the latter was at Emporia. He returned on the night of the 3rd. Baker and Segur after dark, were called out, both were wounded, and, retreating into the house, took refuge in the cellar. The house was fired, and Baker burned to death, and Segur, who escaped, died the next day. below the Purgatory River, in latitude 38 5' 36", longitude 26 3 ' west. 5. Fort Larned (see Chapter I, page 12), was established October 22nd, 1858, for the protection of the Santa Fe trade, on the right bank of the Pawnee Fork, about seven miles above its mouth, 38 10' north latitude, longitude 22 west. It was named', June, 1860, for Colonel B. F. Lamed, then paymaster-general, though first called Camp Alert. 6. Fort Dodge (see Chapter I, page 12), was located in 1864, by General G. M. Dodge, United States volunteers, the site being an old camping ground for trains going to New Mexico. It is in latitude 37 50' north, longitude 100 west. A Colorado regiment camped there before the establishment of the post. It was a four-company post, and was abandoned in 1882. 7. Colonel Aubrey (see Chapter I, page 14), was a French Canadian by birth, and made two trips on horseback between Santa Fe and Independence; the first in eight days, in 185 ; and the second, on a wager of one thousand dollars, in five days, in 1852. He was killed by Major R. H. Weightman, once editor of the Santa Fe "Herald." See "The Overland Stage to California," (by Frank A. Root, 1901), pages 54 and 425. 8. Fort Atkinson (see Chapter I, page 12), a government post on the Arkansas River, twenty-six miles below the crossings of the Arkansas; established August 8th, 185 ; abandoned October 2nd, 1854. According to Gregg's "Commerce of the Plains," issued in 1854, Point of Rocks was six hundred and ten miles out from Independence, Missouri, and the crossing of the Arkansas was about Cimarron station, on the Santa Fe railroad. "I hear many complimentary comments upon your article. A Hutchinson business man, who is something of a literary critic, bought the first copy of the "Echos" sold here and remained away from his store in the afternoon to read the book. When he next saw me he said, 'Robert M. Wright is the whole thing in your little book.' "If there were time I could mention other appreciative remarks about your popular contribution. "I am very grateful for your support during the months I worked on the book. In spite of some discouragement, the work was very enjoyable, and I have been paid a thousand times by the appreciative interest of patriotic Kansans. "I hope you may be present when the Rock is formally transferred to the State. "Yours very sincerely, "MARGARET PERKINS." soldiers frequently stopped, and they found the whole family murdered, the wife and mother lying on the floor with he entrails covering her face. He said the soldiers took an oath to kill every Indian they came across. II. Fort Zarah (see Chapter V, page 9r) was established September 6th, 1864, by General Samuel R. Curtis, then in command of the military district, and named in honor of his son, Major H. Zarah Curtis, who was killed at the Baxter Springs massacre, while on General Blunt's staff, October 6th, 1863. Fort Zarah was about five miles east of Great Bend, in the present Barton county.